Welcome back to Medieval Monday! 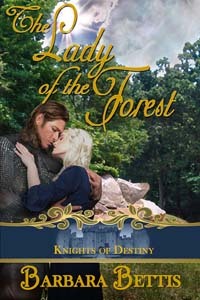 I’m pleased to have Barbara Bettis with me today, and I’m featuring her work, The Lady of the Forest. Sam’l had allowed her to continue searching, to actually capture another, when he knew the real traitor already lurked at Stonehill? Why? Then she realized another import of Jamie’s words. Follow along next week at https://sherryewing.com/blog/. Be sure to leave a comment for a chance at an ebook of your choice. Lady of the Forest is one of my favorite books! Thank you for sharing this excerpt. Such a good story!